This is the type of dish you prepare the night before by marinating it overnight and finish it in the oven the following day. It makes it very easy to do during a busy work week. This is a Nigella recipe that I found on a magazine. The house smells really good while the dish is in the oven. This is also one of those recipes where you can be really loose when it comes to the ingredient list. Use dry mustard if you don't have Dijon, whatever herbs you prefer or have in hand will do, add more onions if you like them, remove garlic if you don't like it, etc. I normally make it with oregano but sage, rosemary or parsley works well too. Squeeze the lemon halves into a large resalable plastic bag and add lemons to it. Add onions, olive oil, mustard, dry oreano and Worcestershire sauce. Mix well, add chicken pieces and season with salt and pepper. Marinate it overnight. Remove from fridge about 30 minutes before you want to bake it. 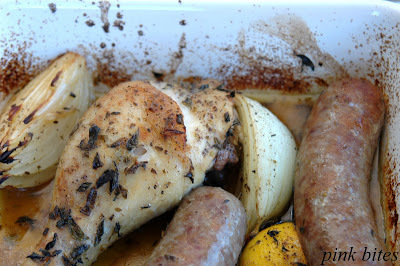 Pour contents of bag in a baking dish, add sausages. Turn chicken skins side up and season again. Sprinkle with the 2 tablespoons of fresh oregano. 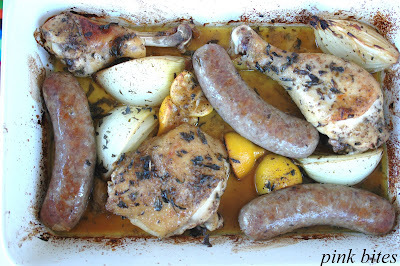 Bake in preheated oven until cooked trough and golden brown, about 1 hour, turning sausages halfway through.